Milkshape unecessary Milkshape is a low cost 3d modelling and animation software. CopperCube imports Milkshape .ms3d files directly. Blender unecessary Use Blender's FBX export. Alternative: Blender (tested with version 2.66, download it here) exports directly to .x: Use the command 'Export to DirectX', select 'all animations'. 3Ds Max FBX Use the built-in FBX exporter. See a description here. Panda Exporter for .x The Panda Exporter is a free plugin for 3D Studio Max and exports animated .x files from 3D Studio Max, which can be imported by CopperCube. Also, see this tutorial on the CopperCube forum for help. max2ms3d The max2ms3d by Martin Collberg exports Milkshape .ms3d files from Max, which can be imported into CopperCube. B3d Pipeline B3d Pipeline includes an exporter an art pipeline from 3ds Max into the B3D format which can be imported into CopperCube. Maya FBX Use the built-in FBX exporter. See a description here. Microsoft .x exporter There exists an .x exporter plugin (including source in DirectX SDK) which can be compiled for various Maya versions. XExporter XExporter by Markus Bergqvist, works with Maya 7.0 and probably down to like 4.5.
cvXporter cvXporter is a DirectX .x file exporter for Maya. Starting with 1.1 are written with Python and will only work with Maya 8.5 and above. Cinema 4D various Use its FBX exporter. Alternative: There are some useful tips on how to get Cinema4D animated meshes exported to CopperCube in this thread in the ambiera forum. Other There are other tools and other exporters available on the web which can export to .fbx, .ms3d, .b3d and .x files. If you want to add it to this list, simply contact us. 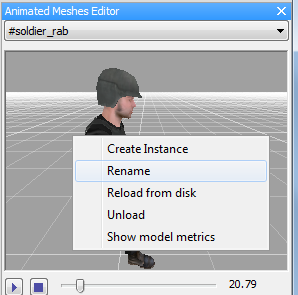 To import an animated character, use either the menu File -> Import -> Animated 3D Mesh or Click the 'Import animated Mesh' button on the 'Scene Editing' Tab. Using the context menu in the Animation editor, you can reload the animated mesh from disk, create another instance of that mesh in the scene, rename the file, and other additional features. Since version 5, CopperCube blends animations when switching between them. This feature is automatically enabled, but can be turned off or adjusted for every animated model manually in the editor or via script. This also means that you don't need to create perfect animation loops. 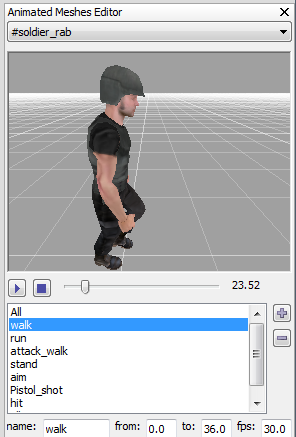 The engine will automatically blend non-fitting animation loops together so that they look nice. You can also change the animation blending time in the same way, use the property 'BlendTimeMs' for this then. Right click the animated mesh, and select "Modify Selection -> Attach node to animated joint"
Select the name of the joint where you want your object to be attached to. 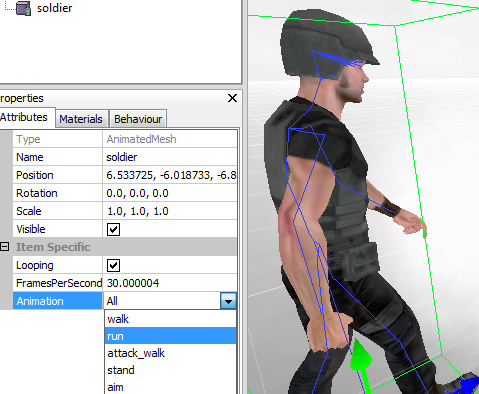 In the Scene Graph Explorer, you will see a new folder object created as child of the animated mesh. Drag your node in the scene graph explorer on top of that folder to make it attached. 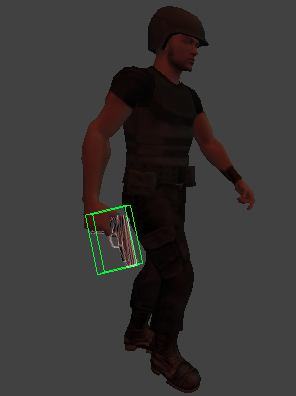 After that, you can adjust the position, rotation and scale of your object to make it look attached exactly. Note: Some of the animated meshes you can find as prefabs in CopperCube have their joints set up so that they have a negative scale, resulting in attached object to look inverted. You can correct this by setting the scale of your attached object to (-1, -1, -1).